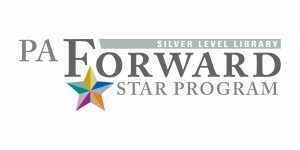 The Sewickley Public Library is honored to announce that the library earned a Silver Star Library designation from the PA Forward initiative of the Pennsylvania Library Association (PaLA). The PA Forward program aims to ensure that libraries have what they need to help people reach their greatest potential and meet the demands of 21st century life. The program focuses on five areas of literacy that are essential to greater success in all vital roles of life: basic literacy, information literacy, health literacy, financial literacy, as well as civic and social literacy. There are three star levels in the PA Forward program – bronze, silver and gold. The Silver Star Library designation is awarded when a library earns a star for supporting each of the areas of literacy – totaling five silver stars. These areas of literacy go beyond the ability to read and write. They emphasize the importance of having knowledge of specific subject areas and the ability to understand and use that knowledge to lead a successful and productive life. ← Calling All Book Lovers!